Americans are pinkos? When it comes to ordering burgers medium rare at a lot of places, yes. Heck, some burger joints recommend it. Meanwhile, in Canada, many restaurants are so afraid of incurring the wrath of health inspectors, they cook their patties to a shoe-leather well done. Thus, regardless of where you come down on the health issue, American places that offer a choice of how you want your six-ounce patty cooked have an automatic hind leg up in my list of top burgers in the mountain west. That’s because a medium-rare or medium burger, like a steak, simply has more flavour and juiciness than dead cow cooked brown all the way through. Interesting toppings certainly help, but a really good burger shouldn’t need too much stuff disguising the main attraction: the meat. 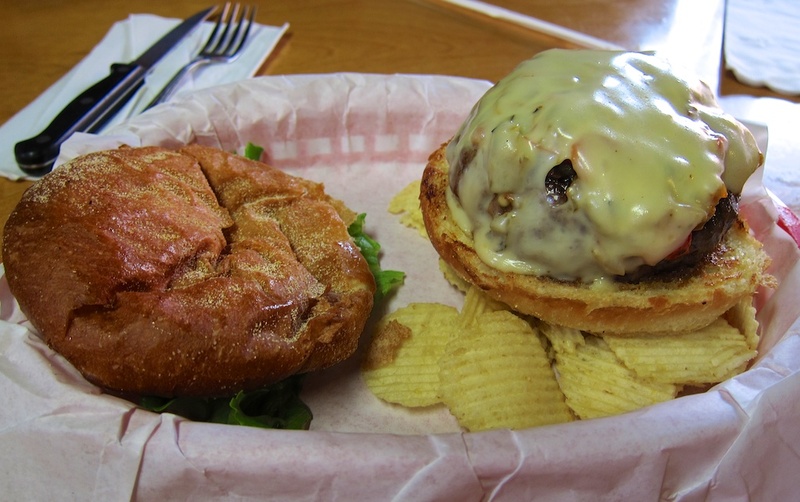 Without further ado, here are my highly subjective picks of best red-meat burgers from my travels through the mountain west of the U.S. and Canada. As always, a * indicates a standout. 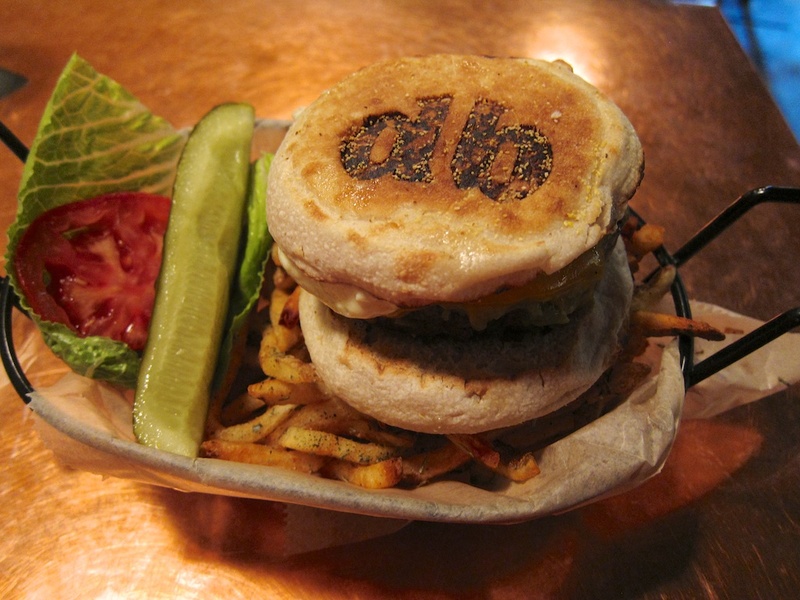 *Diablo Burger can be a bit hard to find: It’s down an alley or out the back of a mall in downtown Flagstaff, Arizona. Kind of like rounding up stray cows. Which is somewhat appropriate, given all its natural meat comes from local, open-range ranches. My search for this hole-in-the-wall, unadorned place is rewarded with arguably the finest burger I’ve had a recent road trip, and I’ve had some damn good ones. Because the beef is 95 per cent lean, Diablo’s recommends a medium-rare burger. And the six-ounce patty indeed comes out pink in the middle and incredibly moist and flavourful. 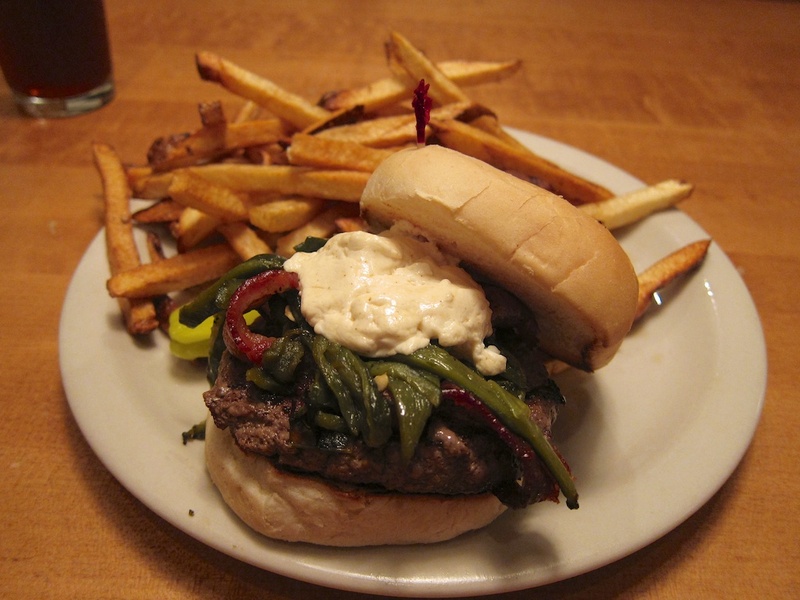 I choose the Blake burger ($11.75), featuring Hatch chile mayo, roasted green chiles and sharp cheddar. It’s all squeezed inside an excellent, locally made English muffin with a nice touch: DB branded on top. The toppings are aptly subtle and the lettuce and slice of red tomato are on the side, for me to add if so desired. But when the meat is this good, I don’t want distractions, though I do scarf down the hand-cut Belgian fries lying beneath this burger king. Note: Bobcat Bite is relocating to 311 Old Santa Fe Trail in late summer 2013, under the name Santa Fe Bite. Nearly ducking my head to get through the door of *Bobcat Bite, in Santa Fe, New Mexico, I momentarily think I’ve entered a homesteader’s cabin (albeit with a pink adobe exterior and pictures of bobcats lining the walls). That’s because the low, dark wood beams are barely higher than the lanky cook’s head, and there’s scarcely room for half a dozen, tightly spaced tables and about the same number of counter seats; I’m asked to move over to make room for a couple of new arrivals. So the character of the place already has me excited. But really, I’m here for my baptismal GCCB (green chile cheeseburger for the non-cognoscenti), a legendary New Mexico concoction, and Bobcat’s version supposedly tops the list. You know it’s authentic when they ask how you want that 10-ounce, freshly ground chuck patty cooked. I go for the recommended medium rare, with no fries to sully the experience. And boy, does it deliver—two inches of one of the most succulent burgers I’ve ever tasted, with the melted chile-cheese topping adding some pleasant but not obtrusive heat. Bobcat’s GCCB is worth every bite for only $9; I don’t even touch the accompanying potato chips. 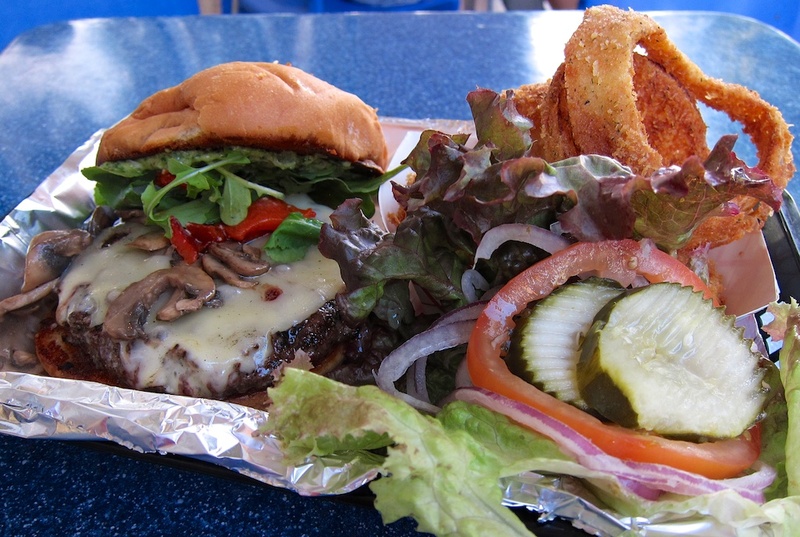 Joe’s Farm Grill, a happening place in upscale Gilbert, outside of Phoenix, produces its own tomatoes and lettuce that go on its local, natural and fresh-ground chuck burgers. Despite the line, an efficient crew soon produces my Fontina burger ($9.50), loaded with roasted red peppers, mushrooms, pecan pesto and melted cheese. It takes a minute to get through the greenery and into the moist, perfectly cooked patty. The burger is wonderfully complemented with an order of rosemary-dill, panko-crumb onion rings, the crispness of the fried batter nicely offsetting the soft, slippery onion inside. What puts things over the top is sitting on the patio on a spring evening—alongside mostly young families at picnic tables—looking out at the farm and a magnificent tamarisk, its giant branches paralleling the ground before reaching skyward. 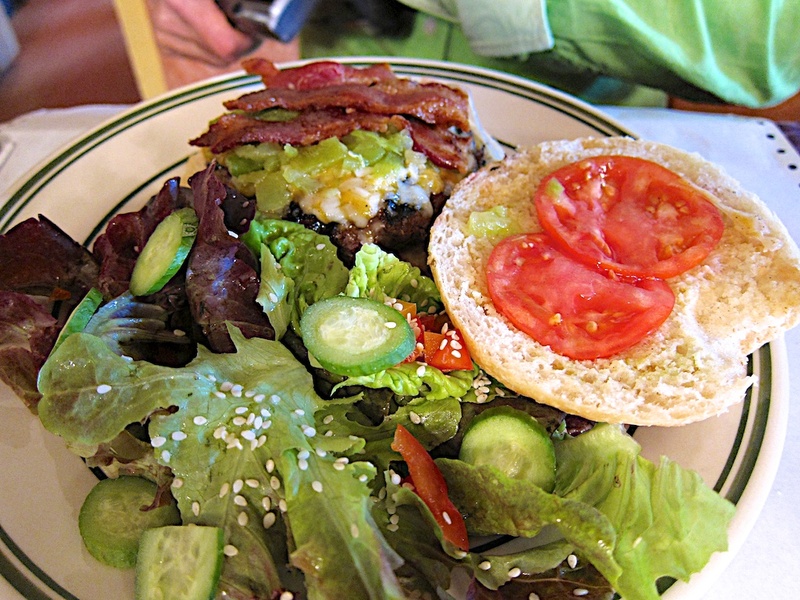 At Joe’s Farm Grill, most of the fixings are right off the farm. I’ve covered this in a previous post, but *Bingo Burger, in Pueblo, Colorado certainly produced the best lamb burger I’ve ever tasted. All burgers and fries are cooked to order, and from a counter seat I can watch my thick, hand-formed patty grilled and then finished under a lid. Next come the twice-cooked fries—from San Luis Valley potatoes—tossed with a little salt. My God, these are easily the best fries on the trip, good enough I don’t want to sully them with the roasted garlic dipping sauce. 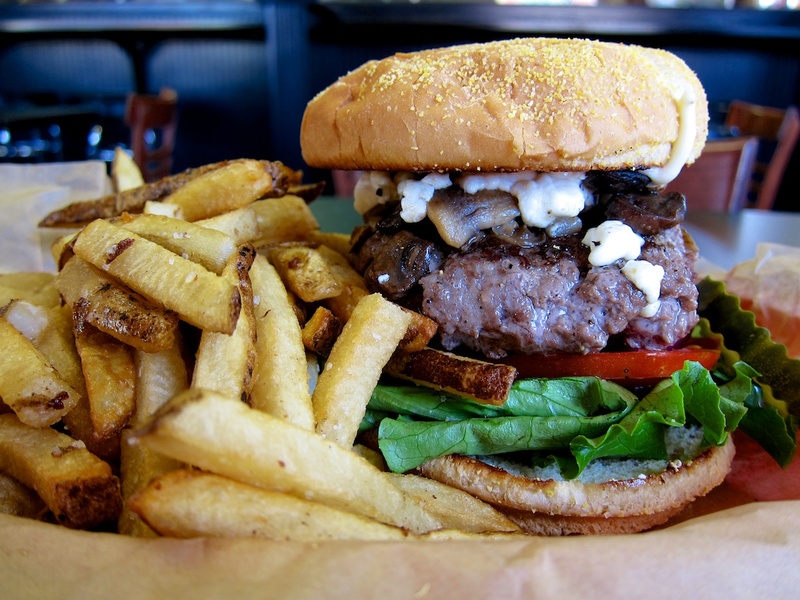 The Goat Hill burger ($9.75, Colorado-raised lamb with goat cheese, mushrooms and a lemon-rosemary aioli) is right up there with it, cooked slightly pink as requested and requiring a well-hinged mouth to bite into. Mountain Sun Pub & Brewery, in Boulder, Colorado boasts a lineup of 12 third-of-a-pound burgers, the Colorado-raised beef cooked to medium. The signature burger is called Date Night, an unusual medley of roasted poblano peppers, smoked bacon, melted goat cheese and, wait for it, date puree. The combination works surprisingly well, with the sweetness of the dates proving a counterpoint to the poblanos’ pungency. The obligatory accompaniment is a generous serving of hot fries that, the menu promises, will be redone if they’re not perfect. *Charcut Roast House, in my hometown of Calgary, Alberta, breaks most of my road-trip food rules. It’s in downtown Calgary, which means parking and a vacant table are hard to find at lunch. 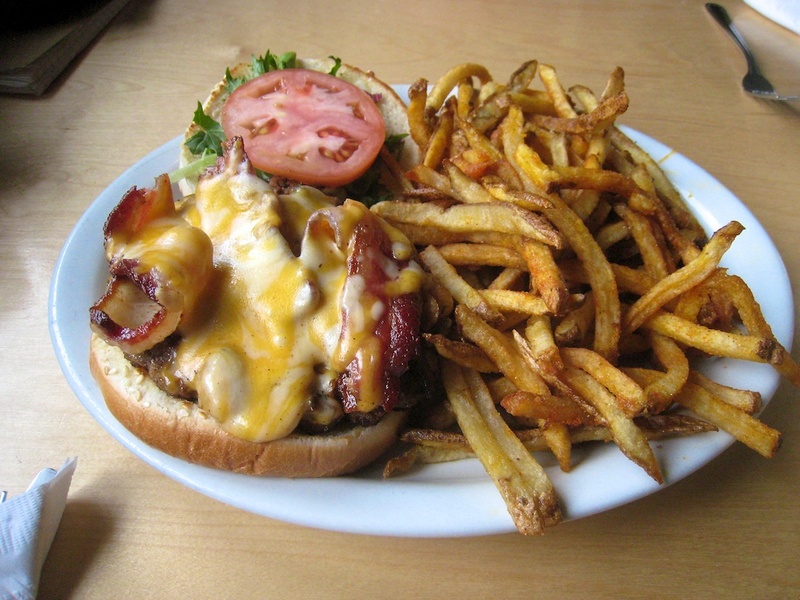 It’s fairly expensive and its signature burger is made of…. pork? 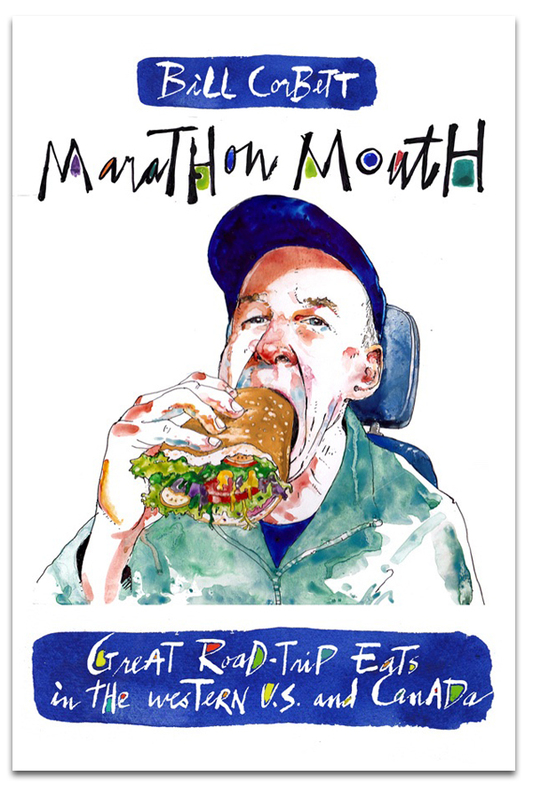 Just ignore all this, and go eat at one of the city’s deservedly hottest restaurants. Here’s a tip: Get there before noon and ask for a seat at the counter, where you’ll get a ringside seat of a first-class team of chefs in action. A friend and I both order the house-ground burger, a massive nine ounces of a unique blend of sausage and beef (70-30%), accompanied by a pile of Parmesan fries and homemade ketchup. Partway through the grill-top cooking, co-owner Connie DeSousa (she finished third in Top Chef Canada; check out the tattoo on her arm), peers over the counter and asks if we’d like an egg and some aioli spread on that burger. After nodding yes, we tuck into these juicy monsters, held together with thick, gooey cheese and a bun that miraculously survives the mauling. Sure, it costs $17, but for one of the better and bigger burgers I’ve had anywhere, it’s still good value. And if we’d paid attention to the name, the Share burger, we could easily have split it. Honourable Mentions: Sugar Nymphs Bistro, is in the tiny town of Penasco on the scenic High Road between Santa Fe and Taos, New Mexico. But it’s definitely a destination restaurant, thanks to the reputation of owner and former Greens Restaurant (San Francisco) chef Kai Harper Leah. I only had a delicious bite, but my sister said the green chile cheeseburger was one of the best burgers she’s tasted. It doesn’t get more local than Chuckwagon Cafe, in the heart of cattle country, in the town of Turner Valley, an hour’s drive southwest of Calgary. Owner and chief cook Terry Myhre finishes steers at his nearby ranch and has them processed into various cuts for dense, hand-formed burgers or steak benedict. 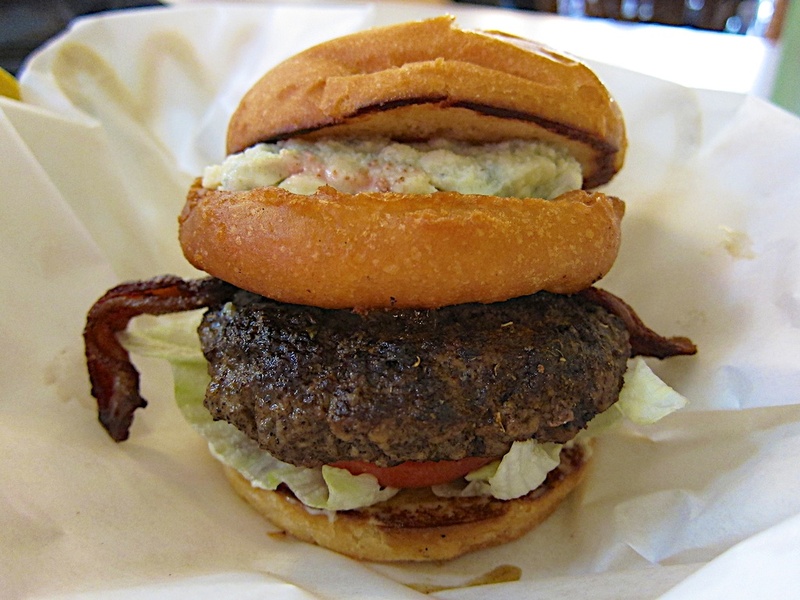 At the The Burger Dive, in Billings, Montana, my Blackened Sabbath is an unusual combination of blackened seasoning, blue cheese, bacon, garlic mayo and the kicker, a thick onion ring that provides a contrasting crunch to the luscious burger. This entry was posted in Alberta, Arizona, Billings, Boulder, Calgary, Colorado, Gilbert, Montana, New Mexico, Penasco, Pueblo, Restaurants, Santa Fe, Turner Valley and tagged best burgers, burger joints, santa fe on May 13, 2013 by bcorbett907. Oh man, I am soo hungry right now, I sure would like one of those burgers..yum. While I appreciate Bill’s comment that medium rare burgers may be more tasty, but it is playing Russian Roulette with your health. The consequences of an E. coli H01:057 infection from a medium rare burger can have permanent long term consequences, including compromised kidney function for life and at worse, death. Children and seniors have enhanced vulnerability. Is eating a tasty, juicy medium rare hamburger worth the risk and the consequences, you tell me? If you have knowledge of anyone who has had HUS, you would be very careful.